OneDoorLand is coming to Ashland!! The magical community and synergenius chefs of OneDoorLand are coming to Ashland, bringing a caravan of art, music, tea, and the Gene Keys Transmission. 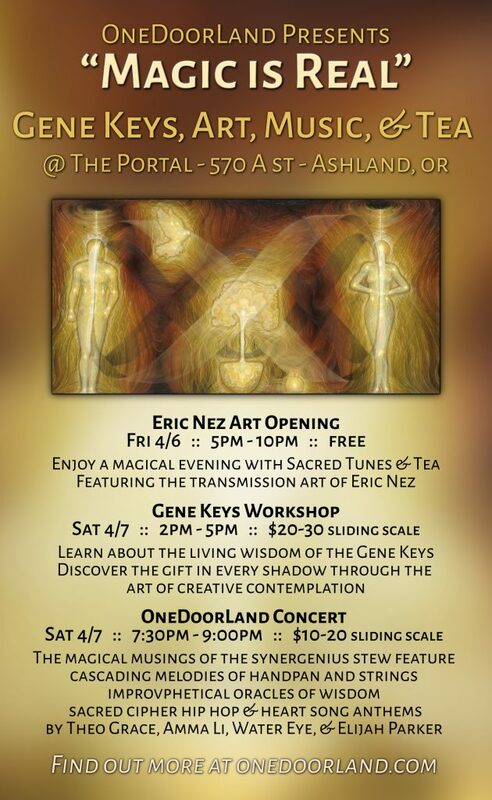 We begin the weekend with an Art Opening at The Portal (and First Friday Art walk) featuring the art of Eric Nez, including tea and music. Join OneDoorLand as we share the magical wisdom of the Gene Keys Transmission, through song and story. Together we will explore the Synthesis of the 64, archetypal codes hidden in our everyday life. We will combine presentation and insights from our own journey into the Golden path, with musical performance and oracular gene keys readings. Whether you are a newcomer to the Gene Keys, or a longtime voyager, this will be a delightful alchemical cauldron to dance in the Living Wisdom together. Experience a night of mystery and magic through music, improvisational oracles and alchemical theater curated by the Onedoorland Synergenius Stew. Melodic handpans and kalimbas cascading into strings and serenading vocals … blend poetry and acoustic medicine songs with the living language of jam band jazz and the Gene Keys. OneDoorLand believes music is medicine, and we aspire to create a serious-silly container of prayer and beauty for deep transformation and collective liberation. OneDoorLand invites you into these intentional spaces to bring ourselves more deeply into the prayer of life, in the wondrous theater of existence, and into more intimate and honest connection with ourselves and the world around us. From here, we witness the growth of community, a nourishing garden to support a new way of living and learning with each other. Thank you for your support. It is an honor to get to travel to Ashland and bring our entire OneDoorLand family and temple with us. Feed the Dream and the Dream Feeds You!